Last weekend, Gina Vasile – one of our Hatchery participants- entered a Hackathon, the last of 4 Hackathons as part of the Salesforce Summer of Hacks. 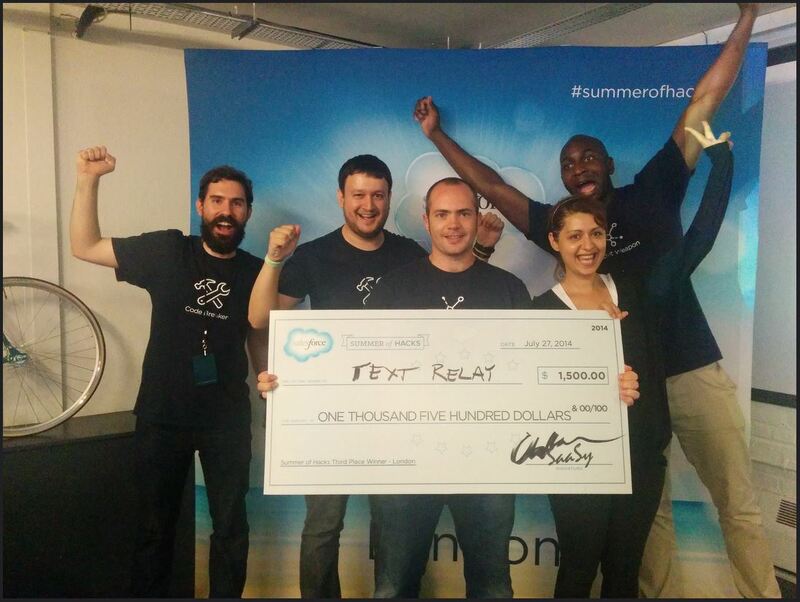 The 2-days challenge was organised by Salesforce and BeMyApp and gathered over 80 Londoners. Hackers were classified as “ideas generators”, “developers” and “designers”. Following the classic Hackathon plan, ideas were first presented, then participants voted for their preferred ideas and teams were formed. Gina joined Andrew’s team, whose pitch was about a mobile app aimed to help deaf people making calls to hearing people. Sounds a bit crazy, doesn’t it? The clock is ticking, let’s start to code! There is only one requirement: using Salesforce Platform in building the app. They worked hard days and nights… and had a lot of fun as well. Indeed, there were plenty of goodies, good food and drinks… and selfie challenges! Great selfie by the way, Gina! But yes, I was saying, they worked hard. Gina worked out some UX and UI features, as she had some experience in this field, and prepared the pitch presentation. With the 4 other members of her team, they managed to develop within 2-days Text Relay, an app aimed to allow deaf or hard of hearing (HOH) people to have a two-way phone conversation. Basically the app converts voice messages into text for the HOH person, and text messages from the HOH person into voice messages. There is of course a small delay for the transcription process, but this can be improved afterwards. The code was submitted on time, Gina pitched Text Relay to the jury, the demo went really well and the transcription was done correctly: it was a success! They ended up third place claiming the $1,500 prize (have a look at the other submitted apps). So well done again, Gina! That’s amazing! So Gina, what did you get from this Hackathon experience? So what are YOU waiting for? You can find some of the forthcoming Hackathons here.